Dale came up tonite & we went to see Bro. Lewis but he wasn’t home so went on to drive-in. Marciano won the fight tonite. Our little dog is so cute. Trying to catch the pastor at home so they can finalize plans for the upcoming wedding, but not having much luck. The big fight finally happened tonight. You can see from this photo of the event’s program that it was actually scheduled for the 15th, but only just happened today. 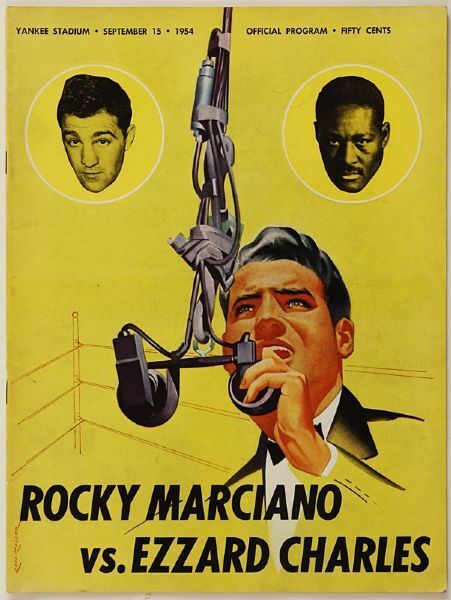 Marciano won by a knockout in the 8th round. You can watch the highlights of the fight HERE. Stayed home tonite. Dale’s grandpa is real sick & in the hospital. Boy’s play in the Atlanta Jr. Hi. tourney tonite. They got home early cause they played early. Bye. I wonder what’s wrong with Dale’s grandpa? She doesn’t say whether the boys won their game. I hope they’re doing better than the high school teams have done. B.B. game tonite – with Clifton Hill – our last one & I cried when it was over, cause I’ll never play again. I fouled out. Dale was there – We made up – Went to Minnies. We’re not getting married till I’m 18 – 7 months. Aw — so sad. Her last basketball game ever. And she fouled out . . . and they lost, which only makes it worse. But at least Dale made it to the game, and they’ve made up. And are still planning on getting married — the countdown to age 18 has begun! Went to Jr. Hi. Tourney at Bucklin tonite with the folks & Ruby & Roy. Buck played. They lost by 2 points & the girls lost. I told Judy about last nite & she’s the only one I’m going to tell for I can trust her. Ooh, it’s so difficult to go on with life as normal when you have such a big secret! Luckily, she can confide in Judy. I see the Junior High teams aren’t having any better luck than the high school teams. Went to Bucklin for a B.B. game tonite. Our teams lost. Me, Judy, Carol, Sue & Charlotte went with Duden in his car. Dale was there & afterwards we & Judy went to Melody Inn. Several were there. More lost basketball games. Sounds like neither team is doing any good this year. I guess the new gym and getting to play indoors has not really helped?